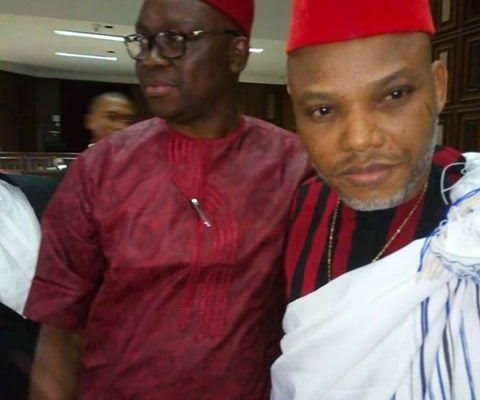 ​Ekiti State Governor​, Ayo ​Fayose​, is in ​c​ourt in solidarity with IPOB Leader, Nnamdi K​anu,​ whose ​hearing ​is set to com​mence​ before Justice Nyako. The court had on April 6 fixed ​today to deliver ruling in the application for variation of the order of court on protection of witnesses in the case against Kanu. Kanu, through his defence counsels led by Ifeanyi Ejiofor, asked the court to set aside the order made on December 13, 2016 for the protection of witnesses. Kanu’s lawyers argued that having been acquitted of the charges of terrorism and importation of weapons, the defendants cannot be tried with the identities of witnesses based on section 36(6) of the 1999 Constitution. However, counsel to the Federal Government, Suleiman Labaran in a counter affidavit urged the court to dismiss the application as a ploy to delay the trial. Recall that Kanu was charged alongside Chidiebere Onwudiwe, Benjamin Madubugwu and David Nwawuisi on charges of treasonable felony and criminal defamation.